Australia prop James Slipper has been banned for two months after twice testing positive for cocaine. The Queensland Reds front row, 28, said he had been suffering depression and "recognises now that I was not coping". 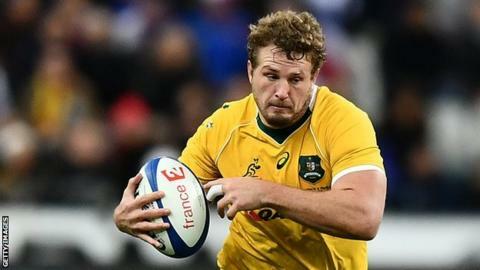 Slipper, capped 86 times for the Wallabies, was fined £15,000 and given the minimum mandatory suspension in Rugby Australia's illicit drugs policy. "We are extremely disappointed to be in this position today," said RA chief executive Raelene Castle. "James has expressed his sincere remorse. We are fully aware that he is dealing with very significant personal issues and we have been working with him since February on these matters." Slipper, who made his international debut in 2010, has played more than 100 Super Rugby games for the Reds. He was omitted from the team that lost to the Wellington Hurricanes last week, with the team citing "welfare reasons" for his absence. "I have been suffering wellness issues, including depression, for a year and have been receiving professional assistance for the last few months," said Slipper, who returned two positive tests for cocaine taken from urine samples between February and May 2018. "In no way do my personal circumstances excuse my actions but I recognise now that I was not coping and that I need to properly address these wellness issues." Slipper's Wallabies and Reds team-mate Karmichael Hunt was suspended for four games earlier this year after he pleaded guilty to possessing a tablet of Xanax.